WILLEMSTAD - Venezuela's state oil firm PDVSA has resumed crude imports for its 335,000-barrel-per-day Isla refinery in Curaçao after a seven-month pause, as it seeks to turn around falling fuel output, according to internal PDVSA documents. PDVSA, which supplies the bulk of Venezuela's export revenue, is increasingly in need of foreign crude as chronic underinvestment slashes its own output, leaving it short of crude to refine and blend. 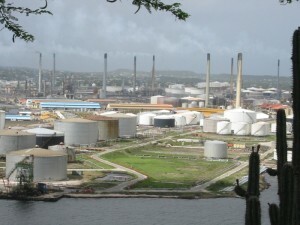 The increased activity in Curaçao comes as more suppliers are accepting oil swaps as a solution to the company's lack of dollars, according to the documents. Cash-strapped PDVSA is increasingly giving its own crude and products away to obtain some of the barrels its refining network needs. Refining problems due to outages and lack of oil have caused intermittent fuel shortages in the OPEC-member nation. The shrinking crude output and exports have not only cut its ability to pay cash for imported oil, but also to buy the food, medicine and supplies the country needs. PDVSA's oil purchases - typically used for refining and blending its heavy crude for export markets - declined to almost none during the second half of last year as the company used most of its cash to pay bondholders and avoid a default. PDVSA has received in recent weeks 1.73 million barrels of U.S. West Texas Intermediate and DSW crudes, and 1.44 million barrels of Russia's Urals crude at Curaçao's Bullenbay terminal, according to the PDVSA's internal data and vessel tracking data, almost the same volume imported in all of 2017. Most imports came from tenders awarded in December to China Oil and trading firm Citizens Resources LLC. PDVSA expects to receive two more U.S. crude cargoes from China Oil, owned by state-run China National Petroleum Corp (CNPC) and Sinochem Corp, and two additional Urals cargoes from trading firm Glencore and Russia's Lukoil , the documents say. PDVSA, Citizens Resources, China Oil and Lukoil did not immediately respond to a request for comment. Glencore declined to comment. PDVSA agreed to prices over $66 per barrel for the crude purchases discharged this year, according to the same documents. The numbers were close to market prices, but still are a heavy load for a country struggling to afford basic goods. Cash payments for the cargoes have been minimal since PDVSA also has agreed to deliver up to 1 million barrels of fuel oil and 3.9 million barrels of Merey heavy crude in exchange for the imports. Such barter deals have become common in recent years as PDVSA strains to obtain hard currency for its crude. A series of oil-for-loan agreements coupled with falling crude output have left the company cash-strapped. In 2017, its oil production fell to the lowest level in almost three decades. Financial sanctions imposed by U.S. President Donald Trump in August have also worsened its cash problems while limiting access to long- and medium-term credit. PDVSA's Isla refinery in Curaçao is one of its main facilities for fuel oil output for exports, but a lack of crude last year limited processing at the plant, causing delays in shipments to Asia, PDVSA's main destination for exports. Venezuela's domestic refineries are also working well below capacity. The country's largest facility, Amuay, entirely halted processing in January. Some units restarted days after, but its catalytic cracker stopped working again this week due to lack of feedstock, according to union sources.